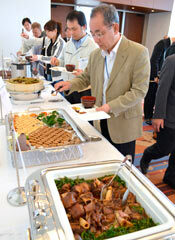 At the Southern Beach Hotel and Resort in Itoman City on March 10, invitees tasting new dishes using locally grown Okinawan Goats. It is a part of the government’s project to create an Okinawan goat brand. Two Okinawan Goats that are hybrid brand of an indigenous goat (Capra aegagrus hircus) and Boer goat from New Zealand, were used in the dishes. The chefs served unique goat dishes that differ from traditional ones, such as Goat Shabu Shabu, Goat Herbal Soup and Goat Carpaccio, for young adults and tourists.